Salesman Nic Simons was the best! Very friendly, and resourceful. Would recommend him for any vehicle purchase. Nic was helpful in getting me the best deal on my vehicle. I had a great experience here. I spoke with Amanda and she was very helpful and courteous. I dropped off my truck for service and initially intended to wait at the dealership. Amanda informed it would take a couple of hours and she was very concerned about me waiting that long so she offered me a loaner car for the time. It was superb service, quite unlike which I experienced at other Toyota dealerships. When I picked back up my truck it was washed. I also checked out the showroom and the salesman was very accommodating with all my questions even though I was just looking. I would definitely go back here again. David Desmond will always be a class act, for a great car buying experience go see David or Wally Miles. Jackie in service rocks! 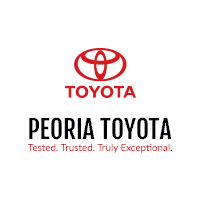 Both visits to Peoria Toyota service were quick and i was taken care of. I would recommend them to anyone! Thanks again Jackie and the team at Peoria Toyota!!! Bought a RAV4 2019 recently Look for Simon Gayed for the best deal along with great service!